A recent report by the Productivity Commission into part-time work in Australia confirms what many have long suspected: people would like to work less. As Kevin Rudd calls for longer and harder hours from Australian public servants, and leads by example to the point of exhaustion, the study has found that there are twice the number of people wanting to move out of full-time work and into part-time work, than the other way around. I for one do not find this surprising. When discussing my own part-time work arrangements a common reaction I get is: 'I'd love to do that'. But I must say, an equally common reaction is genuine perplexity. 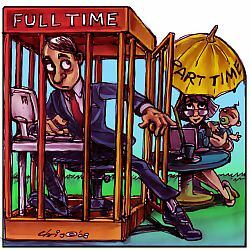 In our society it is largely expected that people only work part-time because of childcare or study commitments, or as a bridge to retirement, excluding the option of part-time work as a lifestyle choice. Nowhere is this attitude more alarming than in the Victorian Police Force, where policy actually prohibits people working part-time out of choice. Prospective part-time workers must meet one of three eligibility criteria, and unsurprisingly, not one of them is related to lifestyle choice — the bridge to retirement is out too. It seems that all too often the dominant focus of part-time work is on reconciling work and family, overlooking the importance of creating time for ourselves and our communities. I know it's not simply a matter of choice, there are very real, complex restrictions — gender, class and ethnic differences — that make striking a healthy work life balance difficult for many people. But still I can't help wonder why some of the hardest working people in the world, in an economic boom time, won't act on their self-confessed desire to work less. A survey in 2007 by the Work + Life Centre found that part-time employees more frequently reported feeling satisfied than full-timers, and that part-time hours were associated with better work/life outcomes. This was confirmed by the Productivity Commission report, which also stated that part-time work arrangements lift workforce participation levels and offer benefits to industry. So if a lack of beneficial outcomes doesn't seem to be the culprit, perhaps a more likely place to point the finger is at cultural constraints. Because, outside the need to validate lifestyle choice as a reason for part-time work, institutional structures and workplace culture could do with a shake up too. 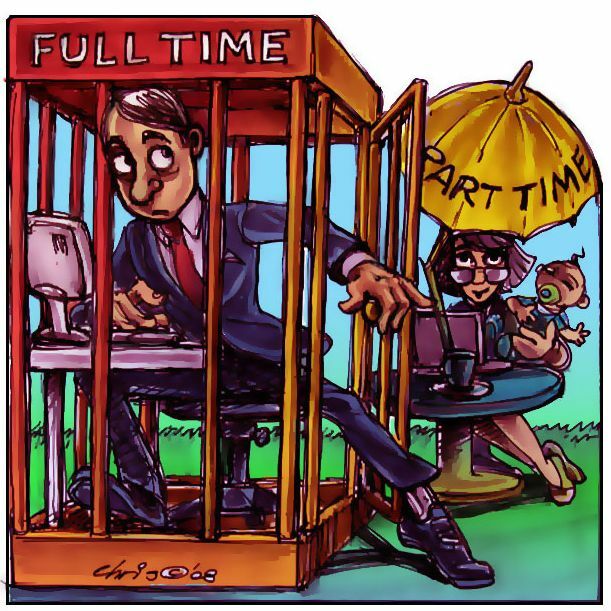 Full-time work remains the 'norm' while part-time is generally seen as the 'lesser other'. Part-time workers constantly report facing the attitude that they are less committed than their full-time counterparts. This is particularly the case in the non-profit sector in which I work, where commitment — not just to your job but to saving the world in general — is measured by the amount of time you spend at work. But perhaps one of the saddest cultural constraints of all is the idea that wealth is related to happiness. Often, tapped on to the end of the 'I'd love to do that' confessions I hear the words: 'if I could afford it'. Average Australian personal debt, between $6–14,000, is at record levels. Debt, and attitudes of being unable to afford 'time', are the results of a consumer culture that says money, and what it buys, is the key to a good life. But wise people have long said that money doesn't equal happiness. Community, family and relationships do, yet these are often the first things to suffer in a culture of overwork. The Work + Life Centre survey also found that 47 per cent of people felt work interfered with their capacity to maintain community connections and friendships. Research into the links between wealth and happiness doesn't paint a much better picture. The Australia Institute found that around 1 per cent of Australians live in households with a net worth of approximately $3 million, but many of them aren't satisfied with their financial position. In households with people living on less than $25,000 a year, 21 per cent felt totally satisfied. None of this is to say that work, full-time work included, isn't fulfilling and stimulating. But when large numbers of people indicate they would like to work less, yet they are not making any correlating lifestyle changes, could the reason be that we exist in a world that tells us we need to work more, to have more, to be happy? Michele Freeman is a freelance writer from Sydney. She currently works part-time with an international aid and development agency. Thanks for this article Michele, it raises some really interesting points. I love working freelance, if only that it forces you to ask the question, what do you do with freedom? I agree with the ideal expressed in your article, Michele. I would, however, be interested to know whether you have a mortgage or pay rent. When you have kids any accommodation is extremely expensive, not just over-sized, luxurious or materialistic accommodation. My wife and I both work four days per week - in relatively low-paid jobs - and it is great. The reason we can do this is because we bought our middle-suburbs house before the boom - luck, basically. The cynic in me also recalls, many years ago, an old lefty pointing out that people who have high debt or high material aspirations are not going to rock the boat, at work or elsewhere, which is good for business, and government. On the other hand, able people, relaxing, being involved in the community etc. is devalued - and we think we live in a free country! I agree with the idea of part-time work as a lifestyle choice but, in a sense, the title of this article is incorrect. If you have enough money you CAN "buy time", i.e., if you can pay someone else to do your housework, you go out to dinner fairly frequently, etc., then you're able to spend less time on domestic tasks and have more time to devote to other things - including, maybe, community activities. After all, most of the great social reformers of history were people who had other people to look after their basic domestic needs. Depending on people's circumstances, such as whether or not they have children or the state of their health, working part-time can mean they spend most of their "free" time on domestic work. I doubt if most people really believe that money can buy happiness; rather, they believe or hope that it can free them from being bogged down in basic domestic tasks and give them some real choices. Great article. But I've noticed that a lot of these sorts of arguments seem to make big assumptions about people who work long hours. If you're young with a family and you ever want to own a home in Sydney, you need to work hard. It's that simple. Part time work is simply not an option in those circumstances. Why do you need to own a home? Because when you stop working, you know that the government won't help much, and you could regret your decision to be holistic when the surgery bills start arriving. People love the idea of raising cattle in the afternoon and reading philosophy in the evenings, but they loved the idea of work even more, in the recession. I agree that there's something odd about the desire to keep consuming at the price of that voice that wants more time with family, community and friends, but if you've got to struggle for the basics, you need to work to keep the family and the community together. WYD pilgrims, like Muslim pilgrims to Mecca, know that in the act of travelling, they will learn things about themselves that they could never learn from books and sermons. Pilgrims are warriors whose battles are internal and spiritual. NSW Government World Youth Day spokesperson Kristina Keneally MP has described World Youth Day as a 'happy event'. She herself has personal experience of spiritual joy at WYD.